Tomasz Kot, Agata Kulesza and Joanna Kulig star in Pawel Pawlikowski's post-WWII drama. 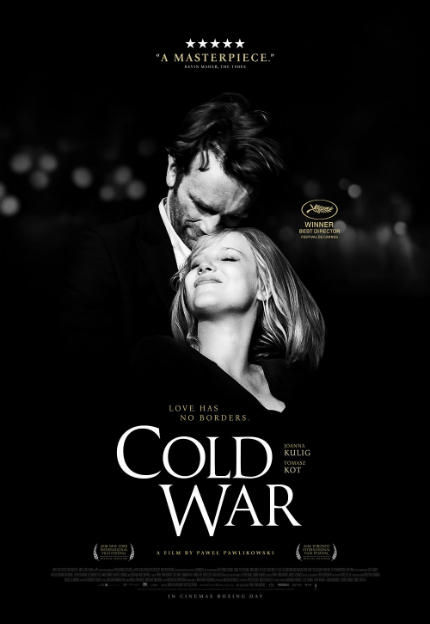 Cold War is a tragic, fatalistic love story set in Poland after the second world war. The year is 1949. Wiktor (Tomasz Kot) and Irena (Agata Kulesza), two musical enthusiasts, are seen traveling and collecting samples of Polish folk music in rural areas. They are pivotal forces behind a newly established Polish state-run music school. While auditioning many young, talented pupils, a sultry, troubled girl Zula (Joanna Kulig) catches Wiktor's eyes. It's a school where they train students to be entertainers on stage, involving not only singing but also choreographed dancing in traditional garb. Zula, talented and with a beautiful voice, becomes a star soon enough. And Wiktor and Zula soon become lovers. Now the year is 1952. Soon the school and its troop becomes a success; the communist regime takes an interest and pressures them to integrate pro-Stalin propaganda songs. Irena objects at first but relents at the insistence of Kaczmarek (Borys Szyc), the founder of the school. Still, it gives the school and Zula an opportunity to travel and perform elsewhere in Europe. While they are performing in Paris, Wiktor suggests to Zula that they defect to the West. But Zula fails to show up at the rendez-vous point and they are separated. Many years pass. Wiktor is now living in Paris, composing and playing piano in a jazz ensemble, living in a tiny apartment, like a true bohemian in French movies. After seeing Zula perform with her traveling Polish group on stage in Zagreb, and after being forcefully removed and put on a train out of Yugoslavia, they are reunited in Paris. The whole Paris scene doesn't satisfy Zula, however. It's too stuck up and Wiktor seems to have lost his mojo in a foreign land. "In Poland, you were a man!" Zula chastises him. After a couple of jealousy fueled fights -- involving poet Juliette (Jeanne Balibar) and movie director Michel (French director Cedric Kahn) in Wiktor's circle of artist friends -- Zula goes back to Poland. Wiktor, crestfallen, decides to go back to Poland for Zula, risking being jailed as a unpatriotic traitor. Pawlikowski deftly directs; like his previous film, Ida, this 90-minute film in a breeze. But whereas this quick, no moment to spare, no time to contemplate pace worked for a young woman coming of age story, for something like Cold War and the subject like tragic love, I wish the director spent a little more time with Wiktor and especially more with Zula, since Kulig, resembling a Slavic Léa Seydoux, is very lovely to look at and listen to. Constantly fading to black after pivotal moments in their lives doesn't feel like just time passing or a mere transition, but more like we've missed out on a lot of details. I understand Pawlikowski's driving idea of 'love has no ideology or borders,' yet the absence of the couple's political allegiance/aversion as 'artists' bothered me (the same way as Ida wearing religion on her sleeve in Ida), especially that no background for either of them was ever fully explored. The ending is beautiful, but I feel like the rest of the film didn't quite earn it. Review originally published during the New York Film Festival in October 2018. The film opens in select theaters on Friday, December 21, via Amazon Studios.